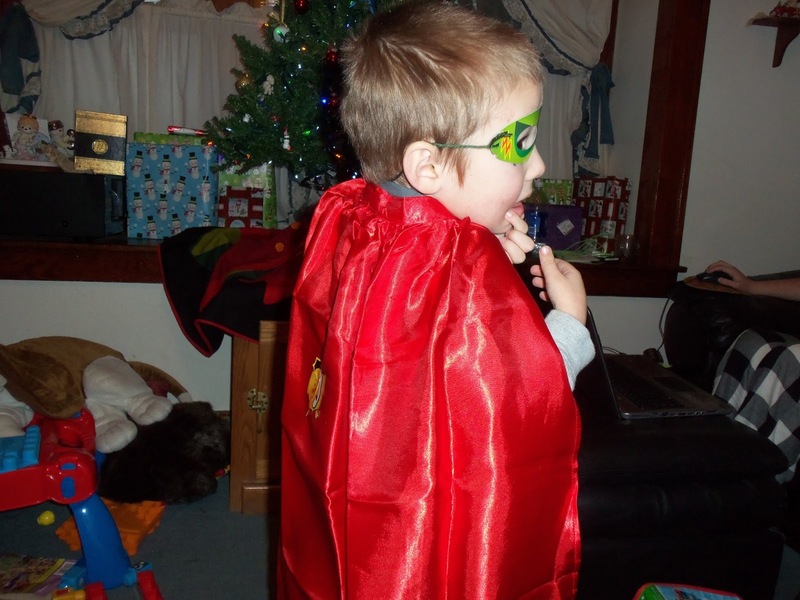 grandma's cookie jar: grandma's chuckles - re-run - You Have to be Brave to be a Super Hero! grandma's chuckles - re-run - You Have to be Brave to be a Super Hero! I have lots of things planned for the second day of my Five Days of Fun, but I thought I'd take a moment to share another of my "grandma's chuckles" from my "archive" with you - enjoy . . .
My sweet grandson, Josiah, is four years old and he is really into Super Heroes! He LOVES the VeggieTales movie, The League of Incredible Vegetables and he LOVES his Super Cape! He will "fly" around my house singing, "♫♥♪ Super Josiah is here ♫♥♪ to save the day! ♫♥♪" Josiah told me yesterday right now he just pretends to be a Super Hero, but when he grows up he will be a Super Hero for real! Did I mention he has a "super" imagination? Yesterday he was being "Super Josiah" when he came over to me and said, "I'm Super Josiah and you can be Super Grandma!" I said, "Okay! My 'super power' will be Super Kisses and Hugs!" Josiah let out a HUGE sigh and said, "Okay, but you HAVE to have a super power for when you fight bad guys, too." I said, "I don't know if I can fight bad guys." to which he replied, "You have to be brave to be a Super Hero." At this point I had a very strong feeling of where this conversation was heading, but went ahead and asked him when I had to be brave. He said, "You have to be brave when you are afraid of something, but it is okay because I will be there with you and I will help you!" I was pretty sure what he would say next, but asked him; "What do I have to be brave for?" Josiah said, "When you fight giant, robot spiders!!!" You may not know this, but Josiah does . . . I'm tremendously afraid of spiders - I don't even like to see pictures of them! So of course I said, "Fight giant, robot spiders???? I do not think I can do that!!!!!" To which he said, "You can do it because I will be there with you and I will help you be brave!" Of course I did the only thing I could do . . . I sighed a HUGE sigh and said, "Okay. I'll be brave." What else was I to say? And yes, we went and fought giant, robot spiders! Josiah told me we were successful in our fight with these horrible creatures . . . and he said we were, "brave"!!! !